Part of the problem, and maybe part of the appeal, of a cheeseburger is that it's over too soon and barely touches the sides. However if you replace that spongy, sugary bun with two 1.5cm rice patties that are squared off like a slice of Wonder White and fried a crisp, golden brown on one side, what you get is a whole lot more belly-filling bang for your buck. Chase Kojima's name might sound familiar because we've been long standing fans of his cooking at Sokyo, our favourite place for high-end sushi in Sydney. 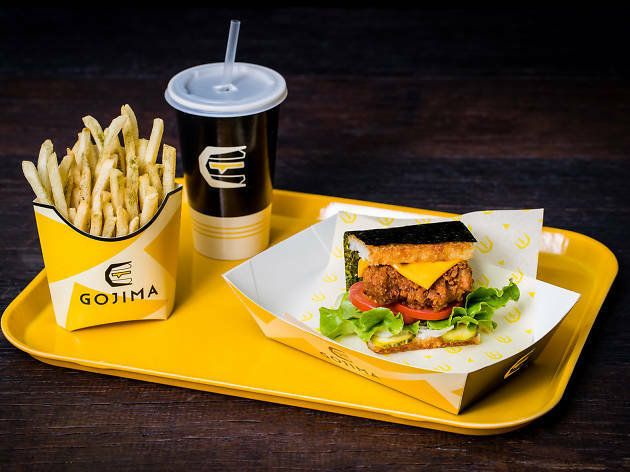 But after a successful pop-up in the Star's food court Kojima has branched out with a permanent low-key offering that blends Japanese and American comfort food. The first thing to be aware of is that this place is popular, so if you're popping in at peak lunch time prepare to queue. You order at the counter and then find a seat and wait for your food to be prepared. 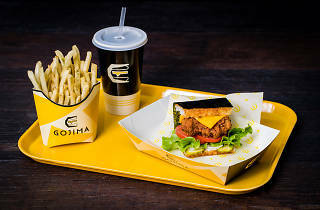 Top score goes to the Gojima Hamburger. The filling has all the familiar flavours that you love in a Whopper – a thin beef patty cooked all the way through, lettuce, tomato, onion, pickles and special sauce – but when sandwiched inside the rice "bun" that comes with a seaweed wrapper, it's heftier and slower going, mostly because the rice sticks to your teeth. Fries here comes with a moreish green seasoning, and the chilli aioli blows the Japanese mayo out of the water on the condiment front. While the hamburger is one familiar food inside another, the sushi in burger form requires yet another snack inception layer again. The sashimi-style miso salmon filling comes with traditional burger accompaniments – lettuce, cucumber and cheese – but because the filling isn't hot the cheese doesn't melt, and we're not sold on cheese and raw fish together anyway. If you want a frozen custard you can take it in thickshake form, or as two scoops in a cup. As a shake, the green tea version is sweet, creamy and the extra richness from the custard base helps balance the savoury smokiness of the matcha. We've already been subjected to the Double Down, and had plenty of fun with the ramen burger, so is the rice burger the zenith of burger fever in Sydney? Or is there a pizza burger or crepe burger yet to come? Only time will tell.